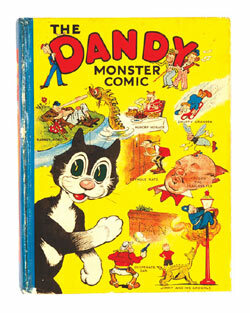 DANDY MONSTER COMIC 1: £2,000 - OOR WULLIE A/W: £825 - BEANO BOOK 1: £1380 - DANDY COMIC 1946,1950 complete years £585 per annum! 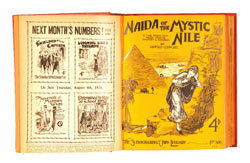 For the second successive quarter our catalogue was a complete sell-out. 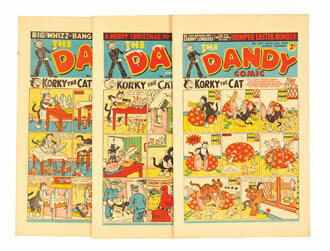 But some of the higher value individual lots kept toward the lower end of estimates with a Fine copy of the Dandy Book 1 selling at £2000 and a VG- Beano Book 1 at £1380, reflecting the current economic trend. 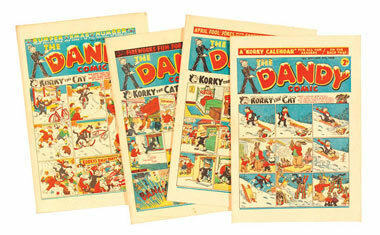 However, this trend was not so with lots estimated in the lower £100s as The Dandy Comic complete year for 1946 made £585, reflecting the rarity of this high grade lot, swiftly followed by the complete year of 1950 which made the same amount, equivalent to £22.50 a copy. 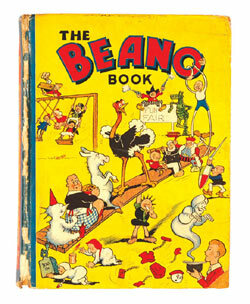 The wartime Beanos comics also confirmed their continued ascendancy with the years of 1941-44 offered at three and four issues per lot. The successful bids averaged £40-60 each with strongly contested Christmas numbers for 1942 at £220 and 1944 at £150, both in VG. 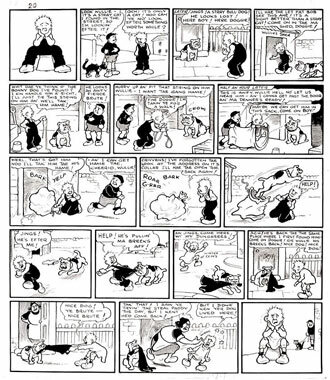 Oor Wullie is up tae his usual tricks. His pal, Soapy Soutar is entering a stray cat in the local pets competition so, not to be ootdone, the wee lad 'finds' a bulldog who then chases him doon the street, latching onto his troosers in the process. ["Help, he's pullin' ma breeks aff"..] Now trooserless an' in his combinations, Wullie is chasin' the brute back oop the street to retrieve them. The misses gies him a thweck fir stealin' 'Paddy' and now he's lost his dungarees as well. Can ye enter a dog-ear in the competition? This hilarious piece, brilliantly crafted by Dudley Watkins, was grrabbed for £825 by an obvious animal lover. 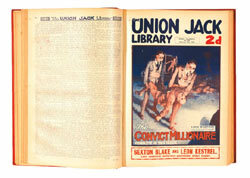 Our bound volume collection continues with firm competition for two particular titles. 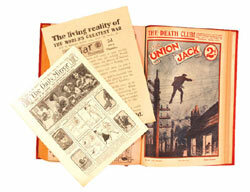 As our pre-war Sexton Blake run has now sold down after two years with only a few volumes remaining The Union Jack title has taken its place as many issues contain the famous detective's stories throughout and are selling between £166 and £250 for complete years. We have highlighted girls' comics and their strong collectable base over several previous Market Reports and there is now a real head of steam built up around this genre. 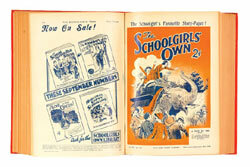 The Schoolgirl's Own title lead the field with a bound year for 1929 reaching £348 and the smaller Schoolgirl's Own Library for 1931 at £335. As well as the UK -- Australian, New Zealand and U S interest was strongly in evidence. Further years will be offered in our November catalogue. 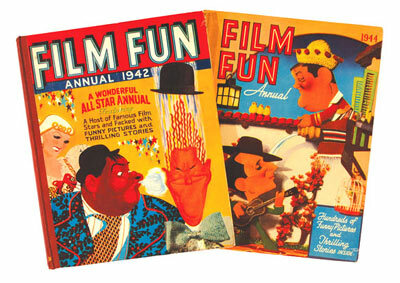 Whilst single copies of Film Fun comics regularly sell for £2-4 each through to the 50s, the rarer 1940s annuals are fish of a different kettle. Their brilliant art-deco covers are worth the admission price alone, a hot ticket £66 each securing 1942 and '44 whilst £25 each was (James) garnered for 1945-9. 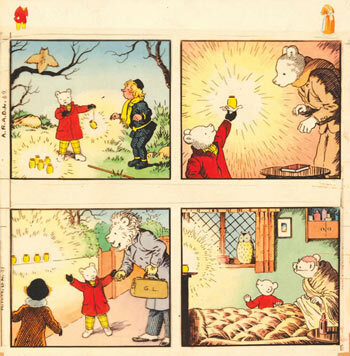 We have been offering Rupert artwork from his annual of 1951 over the last few catalogues and their values are slowly appreciating. 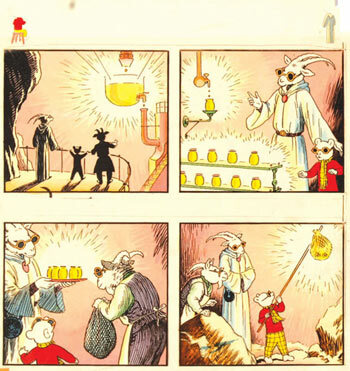 In a piece entitled 'Rupert Sees The Light', our favourite young bear, looking particularly cool in his shades, made £160, whilst his last page appearance in the story 'Rupert and Dr Lion' secured £137. The final 3 pieces of artwork from this story will be in our next catalogue in November. Into the Swinging 60s with a bound volume of Poppet starring Sally Star, Newsgirl Nicky and how to apply scream-proof mascara. But possibly this 1964 half-year and its pop pics of four Northern lads might have had something in the way she moves. £292. Fab. However, nothing could be as fab in girls comics as Lady Penelope with her cool crime-solving capabilities behind the ever-present Parker (Leave it to me, m'lady) in the pink Roller. 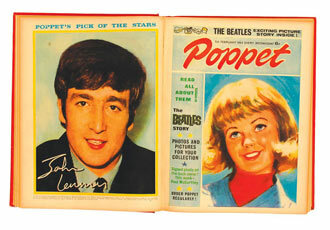 1966 issues averaged £8-10 each and were a very reasonable purchase by a cool City customer. POW! 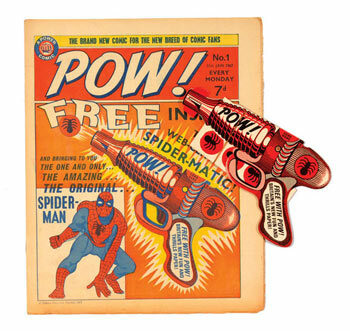 No.1 with its free Spider-Matic Pistol fired a winning bid of £88 and should be a first class investment for the future, its gift unfired in anger. But that was not why it was purchased - our last paragraph story will tell you more, dear reader. 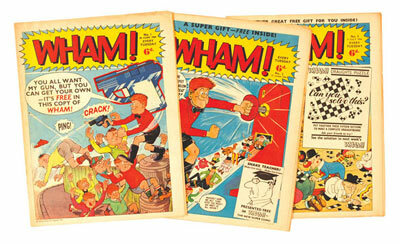 Leo Baxendale's opus, WHAM! was offered from 1-150 and George's Germs, Danny Dare and Frankie Stein did not disappoint with a successful bid (no Tiddler) of £617. In our previous catalogue in June the complete run of 1-187 sold for £610 underlining the strength of this ground- (and school) breaking title. 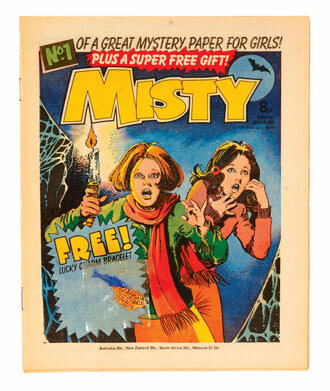 Misty showed the continuing strength of girls' comics into the late 1970s where the combo of first issue comic and free gift bracelet charmed a winning £60 bid. 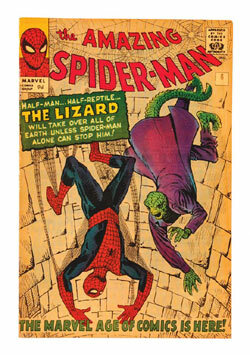 Our US section featured a low/mid grade early run of Amazing Spider-Man where pence copies of #1 made £495, #3: £115, #4: £110, #6: £99. 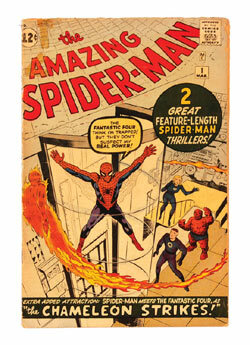 All firm prices for this most popular of US Silver Age titles (crawler). 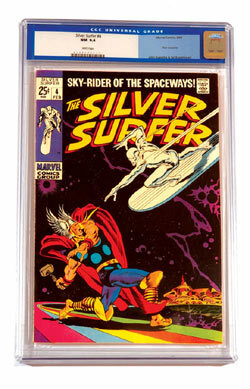 Silver Surfer, the trippy sentinel of the skies, was preserved in plastic for his iconic battle with Thor, where this slabbed CGC 9.4 copy carried off £660 (but how will you find out who won?). 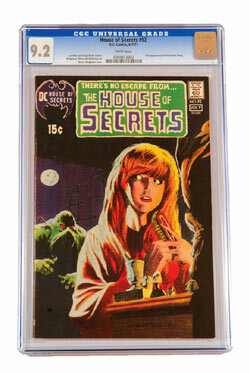 Clad in the same armoury, House Of Secrets #92 (in 9.2) retained its mystery at £495 and you can't even get Swamped by the Thing. (Something's not wright, son). The chap who bought our copy of POW! No 1 was so thrilled with his purchase he called to remind me of the day his Dad had brought home the original first issue for him to read in 1967. The excitement of Spider-Man, Jack Magic, the strange tales of Nick Fury Agent Of S.H.I.E.L.D. - (who even rivalled Wee Willie Harris, The Spy From Skye a few pages further on) all combined brilliantly with The Dolls Of St Dominic's and Dare-A-Day Davy's back page disasters. And you also got a gun with Spider ammo and it was included in the 7d as well! For a heady £100 purchase the innocence of our customer's youth is recaptured, the price of no consequence.